1953 saw the last of the major polio epidemics in North America. In Canada that resulted in almost 9000 cases with over 500 deaths. That was an 18% mortality rate and that figure climbs as high as 30% for adults. The mortality rate isn’t as high anymore where polio still exists but then medicine has come a long way and the development of antibiotics has made a major contribution. Many of the deaths in those days were attributed more to infection than the actual polio. In todays society the mortality rate should be zero. With the vaccine there is absolutely no excuse for people to have to suffer the loss of loved ones due to the devastating disease. 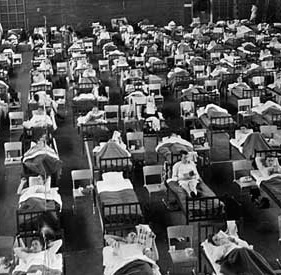 The 1953 polio epidemic happened in the early days of penicillin. In June 1942 there was just enough US penicillin available to treat ten patients. Although it had been around many years it wasn’t until 1945 that mass production was started for the use of the general public. Sulpha drugs were the antibiotic of choice then and they created a wide range of other issues. As I had indicated earlier the high number of polio cases required dormitories, not hospital wards. The numbers were just to high. The sudden jump in numbers put huge strains on limited resources and many people just didn’t get treated. This was also before the time of socialized medicine in Canada so it was a user pay process. Following my initial diagnosis I spend almost a year in the King George Hospital. By the time my fourth birthday came around I had spend a quarter of my early life in a hospital. By the time I turned 16 that percentage had doubled but that is a story for later. I never experienced any surgery in Winnipeg, that didn’t begin until my family moved us to Calgary. In fact the move to Calgary was because the Junior Red Cross Crippled Children’s Hospital (now evolved into the Alberta Children’s Hospital) was offering free treatment to child survivors of polio. It was to obtain treatment for me that my parents decided to uproot the family in 1957 and head for Calgary. Again a tale for another time. I did experience the treatment of the day in Winnipeg. That involved stretching out the affected limbs to keep the tendons from contracting. That was either done with splints, a body frame or casting. It was all dependent on the severity of the contractions going on. And that was related to how much of the virus they were able to drain off from the spinal tap. In my case it started with casting. I don’t remember the cast very well but I can still feel the acrid taste of the ether in the back of my throat. I also remember the gauze mask and I am reminded of it every time I use a strainer with cheese cloth. The was the anesthetic of the day and it wasn’t uncommon to be accompanied with vomit. I only have one memory of that and it is mainly olfactory but very vivid. My parents were able to take me home for Christmas that year but on an out-patient basis and with casts on both legs. My mother was seven months pregnant at the time with who was to be the fifth addition to the family. That brother would be almost three months old by the time I came home again. My only memory of that Christmas was my father carrying me home from a function down the street and him being sick. My mom recently told me that I had asked him if he was breathing that “terrible smell” but in reality is was too much Christmas cheer. Following my three day Christmas vacation I was returned to the King George. It was shortly after my return that the hospital began to slowly practice the Sister Kenny approach to polio rehabilitation. This approach revolutionized the approach to treating polio. It also contributed to my aversion to the smell of wet wool to this day. I will save that topic for my next little entry. Let me close this one with a couple of quick thoughts. First, I DO NOT have polio. I live with the results of polio. Polio is a virus that runs its course and then it is finished. 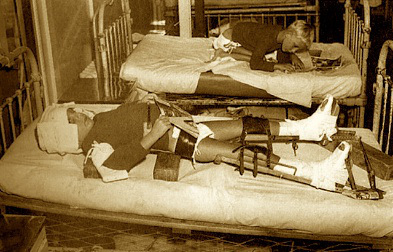 As a polio survivor you deal with the consequences of the virus which can be very diverse (from walking with a limp to living in an iron lung). Telling me I have polio is like telling someone with an acquired disability due to a car accident that they live with the car accident. They don’t, they live with the results and it is called paraplegia. And second, in 1994 the North and South America’s were declared polio free by the Centres for Disease Control and Prevention. Twenty years later this is no longer true. There is no reason for children or adults to have to live with the threat of this devastating disease again. Not when such a simple approach, the polio vaccine, exists. As a polio survivor I don’t ever want to see the rise of this disease again. I realize the avoidance of vaccines is a growing movement however every time someone refuses to vaccinate their child, they don’t only threaten their child’s health but they threaten the health of every child in the community. This entry was posted in Disability, Personal Life and tagged 1953 polio epidemic, CDC, independent living, living with a disability, polio, social activism, Terry Wiens. Bookmark the permalink.